This antibody is specific for Histone 2B. Synthetic peptide conjugated to KLH derived from within residues 100 to the C-terminus of Human Histone H2B. Our Abpromise guarantee covers the use of ab1790 in the following tested applications. WB Use a concentration of 0.1 µg/ml. Detects a band of approximately 17 kDa (predicted molecular weight: 14 kDa).Can be blocked with Human Histone H2B peptide (ab16101). ChIP Use a concentration of 2 - 3 µg/ml. Chromatin was prepared from U2OS cells according to the Abcam X-ChIP protocol. Cells were fixed with formaldehyde for 10min. The ChIP was performed with 25µg of chromatin, 2µg of ab1790 (blue), and 20µl of Protein A/G sepharose beads. No antibody was added to the beads control (yellow). The immunoprecipitated DNA was quantified by real time PCR (Taqman approach for active and inactive loci, Sybr green approach for heterochromatic loci). Primers and probes are located in the first kb of the transcribed region. HeLa cells were fixed in 100% methanol for 6 minutes at -20°C. The cells were washed 3 times in PBS then incubated with ab1790 (0.5µg/ml) for 1 hour at room temperature. The panel of images shows the cells stained with ab1790 (green) and counterstained with DAPI (blue). 100x magnification. Histone H2B - ChIP Grade was immunoprecipitated using 0.5mg HeLa whole cell extract, 5µg of Rabbit polyclonal to and 50µl of protein G magnetic beads (+). No antibody was added to the control (-). Proteins were eluted by addition of 40µl SDS loading buffer and incubated for 10min at 70°C; 10µl of each sample was separated on a SDS PAGE gel, transferred to a nitrocellulose membrane, blocked with 5% BSA and probed with ab1790. IHC image of Histone H2B staining in human breast carcinoma FFPE section, performed on a BondTM system using the standard protocol F. The section was pre-treated using heat mediated antigen retrieval with sodium citrate buffer (pH6, epitope retrieval solution 1) for 20 mins. The section was then incubated with ab1790, 1µg/ml, for 8 mins at room temperature and detected using an HRP conjugated compact polymer system. DAB was used as the chromogen. The section was then counterstained with haematoxylin and mounted with DPX. Chromatin from Xenopus laevis oocytes was prepared according to the Abcam X-ChIP protocol. Oocytes were fixed with formaldehyde for 10 min. The ChIP was performed with 25 µg of chromatin, 3 µg of ab1790 (anti-H2B, light blue) and 3 µg of ab1791 (anti-H3, dark blue), and 20 µl of Protein A/G sepharose beads. A non-specific antibody was used as a control (yellow). The immunoprecipitated DNA was quantified by real time PCR (Taqman approach). ICC/IF image of ab1790 stained HeLa cells. The cells were 100% methanol fixed (5 min) then permeabilised using 0.1% PBS-Triton and then incubated in 1%BSA / 10% normal goat serum / 0.3M glycine in 0.1% PBS-Tween for 1h to further permeabilise the cells and block non-specific protein-protein interactions. 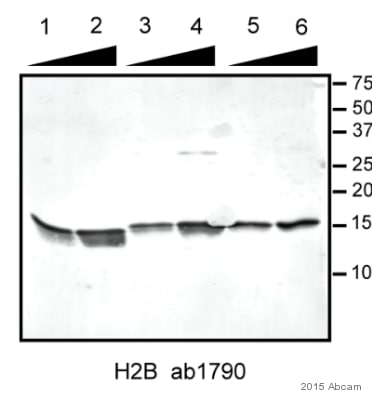 The cells were then incubated with the antibody ab1790 at 0.1µg/ml overnight at +4°C. The secondary antibody (pseudo-colored green) was Alexa Fluor® 488 goat anti- rabbit (ab150081) IgG (H+L) preadsorbed, used at a 1/1000 dilution for 1h. Alexa Fluor® 594 WGA was used to label plasma membranes (pseudo-colored red) at a 1/200 dilution for 1h at room temperature. DAPI was used to stain the cell nuclei (pseudo-colored blue) at a concentration of 1.43µM for 1hour at room temperature. 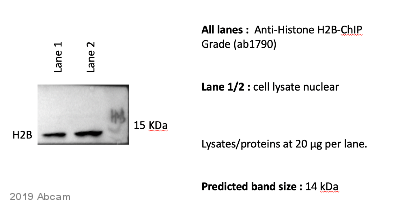 ab1790 at 1/3000 detecting Histone H2B from Xenopus laevis (S phase egg extracts - whole cell lysates 60ug per lane) by Western Blot. The egg extracts were fractionated using a gel filtration column and every other fraction (4 - 26) was loaded onto a 8-16% gel. The input corresponds to 1ul of crude extract. 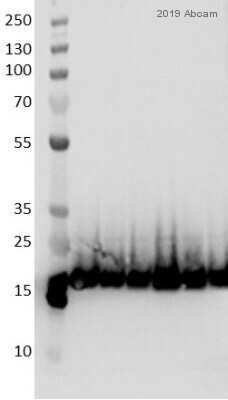 In this experiment an HRP conjugated donkey anti-rabbit antibody was used as the secondary. Publishing research using ab1790? Please let us know so that we can cite the reference in this datasheet. I will test your new lot of antibody... hoping that it works as well as the old one. I am sorry this product did not perform as stated on the datasheet and for the inconvenience this has caused. As requested, I have issued a free of charge replacement with the order number 1192133.